This set of -ab words clip cards is by far our largest set of cvc word clip cards. 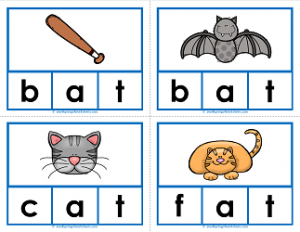 It has nine words: bat, bat, cat, fat, hat, mat, pat, rat and sat. THat was not a typo – there are two cards for the word “bat” – one for a baseball bat and one for a bat the animal.